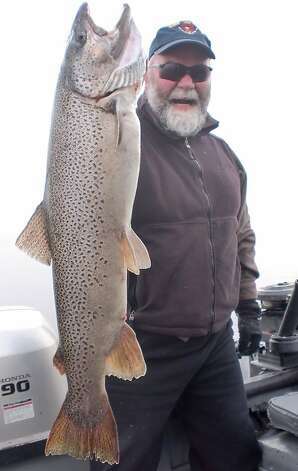 Turns out there’s a climate-related reason why so many big fish are being caught on the south side of Lake Tahoe this winter, including a giant trout that weighed in at 28 pounds, 9 ounces two weeks ago. The jet stream that delivered a ton of rain to Tahoe a month ago stirred up the lake’s juvenile shrimp and crawdads, and high winds pushed the fish food from west to east, causing it to stack up at the west-facing underwater ledges off the southeast shore, Chronicle outdoors writer Tom Stienstra says. Photo is of Gene St. Denis, holding his 15 pound, 9 ounce catch from a week ago. His son, Eric, caught the 28-pounder.